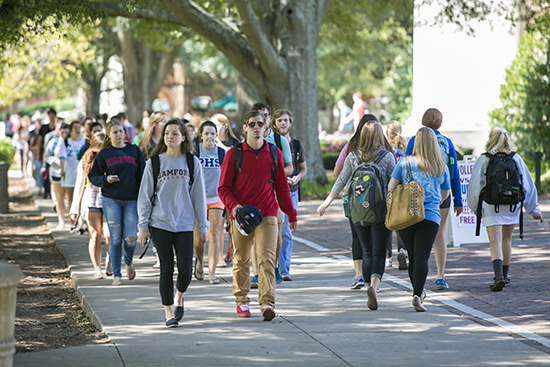 Samford University has announced a record spring semester enrollment of 4,751, a 1.1 percent increase over spring 2014. The total includes 2,856 undergraduate and 1,895 graduate/professional students representing 45 states and 31 countries. R. Philip Kimrey, Samford’s vice president for student affairs and enrollment management, noted that the freshman retention rate was a very high 97 percent from the fall to the spring semester. He credited university-wide initiatives to help students succeed academically in both the high retention and record enrollment numbers. The record enrollment comes at a time of unprecedented growth for the university, Kimrey noted. The new College of Health Sciences, now in its second year, is adding new undergraduate and graduate programs each semester. Among other growing academic programs are business, journalism and mass communication, and graduate education programs. Samford also continues to receive national recognition, he added. U.S. News & World Report ranked Samford 3rd in the south among regional universities in its 2015 college rankings. Samford is ranked 1st in Alabama by Forbes Inc.’s college rankings. Samford also has been ranked for academic programs and value by Kiplinger’s Personal Finance and The Princeton Review, among other prestigious publications and rankings.